In the 1990s, the World Wide Web helped transform the Internet from the domain of computer scientists to a playground for mass audiences. As URLs leapt off computer screens and onto cereal boxes, billboards, and film trailers, the web changed the way many Americans experienced media, socialized, and interacted with brands. Businesses rushed online to set up corporate “home pages” and as a result, a new cultural industry was born: web design. For today’s internet users who are more familiar sharing social media posts than collecting hotlists of cool sites, the early web may seem primitive, clunky, and graphically inferior. After the dot-com bubble burst in 2000, this pre-crash era was dubbed “Web 1.0,” a retronym meant to distinguish the early web from the social, user-centered, and participatory values that were embodied in the internet industry’s resurgence as “Web 2.0” in the 21st century. 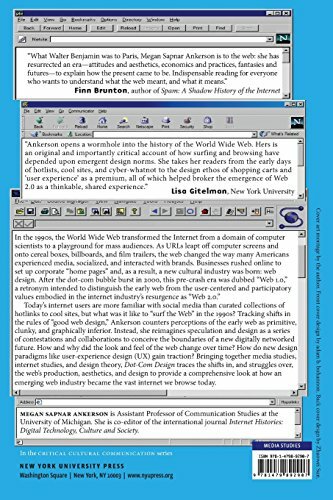 Tracking shifts in the rules of “good web design,” Ankerson reimagines speculation and design as a series of contests and collaborations to conceive the boundaries of a new digitally networked future. What was it like to go online and “surf the Web” in the 1990s? How and why did the look and feel of the web change over time? How do new design paradigms like user-experience design (UX) gain traction? 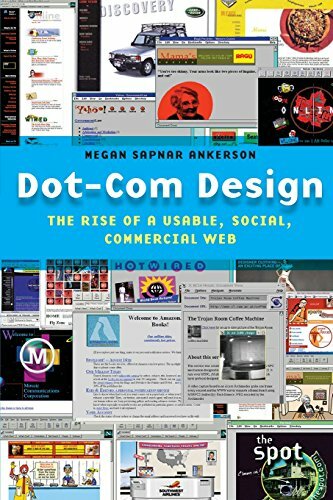 Bringing together media studies, internet studies, and design theory, Dot-com Design traces the shifts in, and struggles over, the web’s production, aesthetics, and design to provide a comprehensive look at the evolution of the web industry and into the vast internet we browse today.